It goes without saying that smartphones have transformed society. According to a survey from the Pew Research Center, as of June 2017, 77% of U.S. adults own a smartphone. But perhaps the most interesting revelation (though not surprising) is we are increasingly using our smartphones as something other than a phone. For example, 53% of 18-29 year olds used their phone to help them search for jobs. That means that people are increasingly looking to their phones for answers, not just phone calls or connecting with their social media. So how can you and your business provide those answers and get into the pockets of over three-quarters of the American population? One peek at the average American’s smartphone, and you’ll see their home screen littered with well-used and well-loved apps. A great mobile app helps save time, money, and sanity for the end user. But what exactly does building a mobile app do for your business? The benefits can be endless, but we’ve compiled some of the best. With a mobile app, you’re always connected with your customer, and in some cases, an app can work even when they’re offline. That means they can do business with you even while they’re waiting in line at the grocery store. Or if they have a question in the middle of the night, they can still find answers right away without having to search for your website. With a well-designed app, you become an advisor or resource that’s accessible 24/7. This is good for multiple reasons. The more time your customer spends in your app, the more they trust, understand, and recognize you. Greater engagement translates into increased brand awareness with your customers. 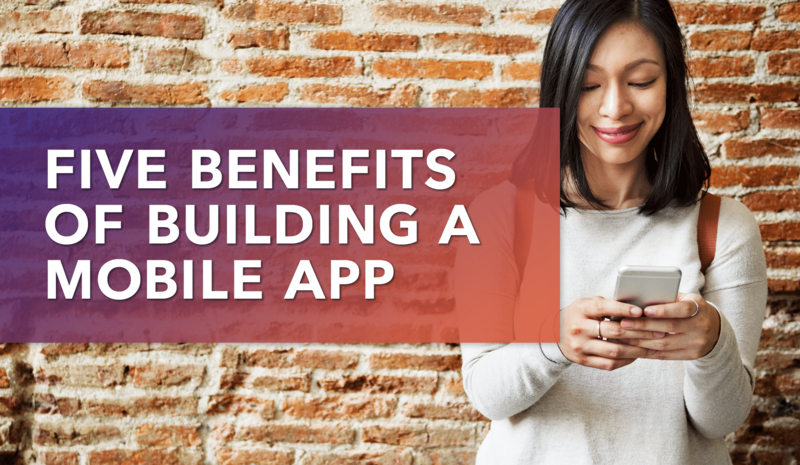 Building a mobile app is typically a large investment up front, but over time it can help decrease your operating costs. For example, a well-designed mobile app can provide automation for customer requests, messages, and frequently asked questions – which can alleviate some of the staff time spent on customer support. Additionally, if you create a smooth user experience for purchasing your product or setting up an appointment for your service, staff will spend less time manually processing this information, and customers will be able to make transactions even after business hours have ended. Any business leader worth their weight knows how important it is to know their customer. With an app, you have access to powerful, real-time information on how people interact with the app and your products. You can see which products are most popular, what people are searching for, how valuable your services are, etc. Over time, this knowledge is invaluable to a growing business, and can help inform your future product and service offerings. The bottom line here is a well-designed mobile app can provide real-time market research to your business. Isn’t this every business owner’s dream? With an app, you have a direct information pipeline to your engaged customers. Every time they interact with your mobile app, they’ll know your latest products, best deals, newest promotions, etc. Furthermore, customers can enjoy easy access to any loyalty programs you might have. Think of Starbucks – their loyalty program creates special promotions ONLY for their app users. What a great way to cultivate customers who are already devoted to your company and inspire new ones to truly commit. How do you see your customers engaging with your business as technology progresses? What are new and progressive ways to add value to your customer base? An app can provide a baseline for testing out new technologies, new marketing methods, and improved user experiences. And since you can monitor your analytics, you will know what works and what doesn’t. But there is one caveat, which brings us back to the survey at the beginning, you need to provide your customer base with easy and efficient answers. Some of the best mobile apps help people make product decisions, inform their eating and exercise habits, tell them the next book to read, or let them know the weather. All of these mobile apps provide solutions so users can live the life they want, so they come back to them time and time again. You can have the best designed mobile app in the world, but if you don’t give your customer base a reason to frequently come back your app will become buried behind multiple screens of apps they use more often. It will remain there, forgotten until your customer runs out of storage space and deletes your app. Frequent use is a key to earning a prime location in your customer’s phone – on, or near, their home screen. At Five Pack Creative, we take the time to know you and your customer base, so your mobile app connects you to them. We work closely with you to create your customer’s most-loved mobile app, so you’re greeting them as soon as they open their phone. Want to find out more about how we can help your business create a mobile app? Schedule a free consultation.